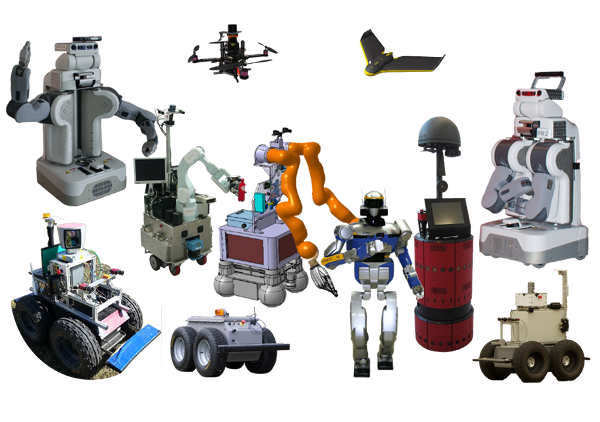 The robots platform includes since 1995 the experimental means of the Robotics theme in the laboratory, as well as engineers and technicians involved in their development and maintenance. At the hardware level, there are two equipped experimental halls (motion capture, an apartment model, safety systems,.. ) hosting two humanoid robots (HRP-2 and soon Romeo), 4 indoor robots (Rackham, Jido and 2 PR2s), 3 robots dedicated to outdoor exploration and several drones. Many software developed at LAAS, especially more than 100 functional modules written with GenoM (The "LAAS" software platform, common to all robots), as well as numerous integration support tools (Pocolibs, GenoM, Tclserv, GDHE, GRH2, OpenPRS, Jafar ... ) distributed as open source on our website, enable the development of experiments in this environment.